Audio Recording of Swallows High quality audio recording of a group of Swallows. 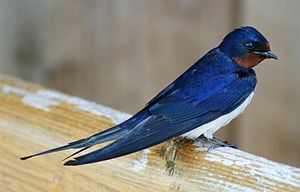 Barn Swallow videos, photos & sounds on the Internet Bird Collection. (European Swallow=) Barn Swallow - Species text in The Atlas of Southern African Birds. Species account at USGS Patuxent Bird Identification InfoCenter. Includes song clips and sonograms. BirdLife species' status map for Europe (pdf).